Note: If this would be your first time attending a Circles on the Water retreat, please call the Training Office at 845-688-2228 to arrange for an interview before registering. A five-day canoe, meditation and arts retreat in the Adirondacks of New York State. 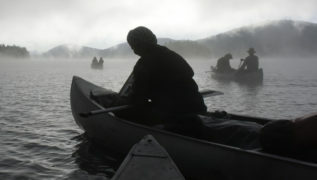 We’ll head into the beautiful back country waters merging with the teachings of the wild. With experienced paddling guides co-leading, we’ll spend time learning the practical skills of canoe strokes, studying Dharma teachings, as well as taking the time to let ourselves drop into stillness. Opening our senses to the treasures all around we’ll bring in forms of creative expression and creative sisterhood. This retreat will be assisted by Shoan, Caroline Zeiss, & Hosei Allore. A Zen priest, Jody Hojin Kimmel, Sensei received transmission of the Precepts from Daido Roshi, who began the process in 2009, and from Shugen Roshi, who completed the transmission in 2012. In 2017, she received full dharma transmission from Shugen Roshi. 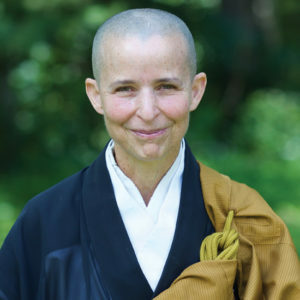 She currently serves as MRO training coordinator and co-Director of the Zen Center of NYC. Before entering the Monastery in 1990, Hojin Sensei studied fine art and trained under legendary ceramicist Toshiku Takaezu, among others. Over the years she has taught drawing, ceramics, and painting, and continues to teach on the creative process within the Mountains and Rivers Order.